Based on the Classic Fusion line, both models are 45mm and about 11mm thick. Due to their colors they wear smaller though with the gold being a bit “flashier” of course. The leather strap is done by Berluti, made in the same way as their shoes are produced. They used the company’s emblematic Venezia leather for both nero grigio (black) and tobacco blis (brown) straps. They are soft as butter and extremely comfortable on the wrist. I was a huge fan of the tobacco strap and Gerard was opting for the black version, but we both agreed that the work on those straps is second to none. 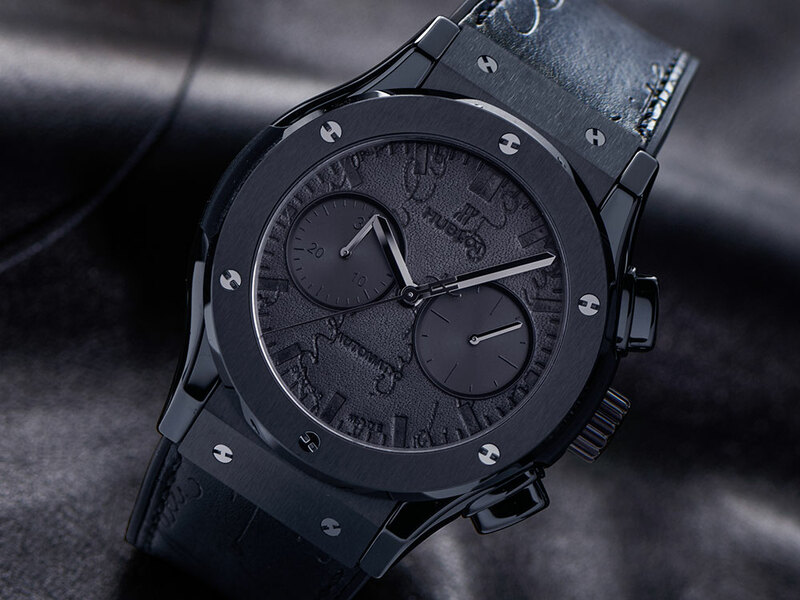 The most interesting feature however is the fact that Hublot used the same Berluti leather as the straps are made of to produce the dial for these limited editions. Yes, a watch with a leather dial. I mean we have seen dials made of literally everything from metal, ceramic, enamel, rock, wood, and even canvas (covered metal) but I can’t recall if I’ve ever seen a watch with a leather dial. It is the same aforementioned Venezia leather Berluti uses with their shoes; or in this case the strap of the watch. How sturdy they will be we have no clue yet; time will tell, though. Limited to 500 pieces, the All Black features a polished and satin finished black ceramic case, sapphire crystal with anti-reflective treatment, display case back. The watch is water resistant to 50m and has a power reserve of 42 hours. With its monochrome jet-black style, the Hublot Classic Fusion Berluti All Black has a nero grigio Venezia handmade strap and Berluti leather dial. It features the Caliber Hublot HUB1100 mechanical, self-winding movement. The pieces are very interesting and show an extremely high level of craftsmanship both by Hublot and Berluti of course. The watches come with a special box that has all equipment you need to treat the leather, like you would treat your shoes. Both watches are so photogenic and look amazing on the wrist. We do not have retail prices yet and of course when it comes to Hublot you really have to take a deep breath before you look at the tag. However I’d like to say that if you are looking for something truly unique and have the money to buy, in this price range and style the Hublot Classic Fusion models are beautiful contestants to consider.ust like the above-mentioned ceramic black version, the Scritto shares the same physical features. The only difference between the All Black and the Scritto is the case material. Polished and satin finished 18K King gold is the material used with this model and unlike its brother it is only limited to 250 pieces. The strap is carved from Venezia Scritto calf leather that has writings inspired by 18th century calligraphy.